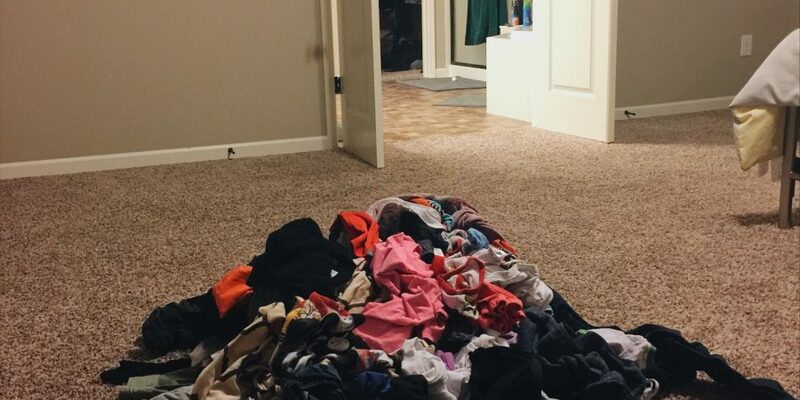 We’ve all been there and seen the giant mountain of clothes staring us in the face. It becomes our Everest and we know we must conquer it. Like climbing Everest, this is not something we can or should do on own. We need a support team to help us. For years I dreaded doing laundry. How could 4 little people plus mom and dad have so many clothes? You know the drill: sort, wash, remember to put clothes in dryer, rewash slightly moldy smelling clothes, sort into piles, fold, put away and repeat. When my oldest was 5 or 6, she wanted to start helping. She would help me tackle the piles of clothes strewn across my bedroom floor. As all the kids got older, we would call them in to put away the clothes we folded and they did it, no questions asked. Laundry folding and putting away became a family activity. The more we did it, which is a lot, they began asking to learn how to fold clothes. This is like a mother’s dream come true. Now at 10 ,8, 6 and 5 they are self-sufficient in the art of laundry. It’s an unspoken rule that if you have a pile of clothes, it must be put away before you get on electronics. Now mind you, they don’t necessarily fold clothes the way I would but that is a moot point. #2: When they leave my house they will have a life long skill of being able to do laundry. Everyone knows how to put detergent in and how to start the dryer. The only issue currently is most of them aren’t tall enough to reach the knobs even with a stool. For awhile we did chore charts but there was no incentive to really get it done. Receiving an allowance wasn’t reward enough to do it and they expected it for putting ONE dish away. They would do the chores for a week or two and then get bored. Even without the chore chart there are things that have to be done around the house regardless of whether you get paid or not. The jobs on their lists are essential to running our house smoothly and less chaotic. Things like putting away clothes, toys, school stuff and dishes are part of working together as a family. As are babysitting younger siblings, making own lunches, and walking the dog. Yes, my children make their own lunches for school. When you start 1st grade, you are on your own. I will assist but only if they ask. I have seen lunches come out of my house that I would never put together because they get to create meals they enjoy. It always includes a main dish like a sandwich or leftovers from dinner, a veggie, fruit, drink and yogurt/cheese. They know the routine and I know they are getting a well rounded meal. The more choices they are able to make on their own, the more confident they become with their decisions. This makes our mornings less crazy because everyone is taking care of themselves. They get their own breakfast and make lunch while mom gets a shower and can get ready for the day while dad quietly sits drinking his coffee. There are times when I do have to motivate the kids to get moving but most mornings I am able to take the dog on a short walk while they are getting ready for school. These are life skills I am teaching the kids to prepare them for adulthood. I was an independent kid growing up. Sure, my upbringing was a little different than my kids because I grew up in a single parent home. I was thrown into the trenches and learned a lot of life skills because it was just me and my mom. I knew how to do laundry at a young age mostly because she shrunk my favorite shirt. Never again! On some level I think she did it on purpose. I might have to try that. I cooked for myself sometimes and could clean up after myself. Among other things these skills set me up to become a responsible, independent adult who could function on my own. When I got to college, I was confident that I could do this thing called life. In high school and college, I worked odd jobs to pay for things I wanted. I was prepared to head out into the world after college even if I did make some mistakes along the way. Financially, I had some learning to do but I eventually figured it out. Damn you, credit cards! I became okay with my failures, moved on and learned from them. The skills I learned as a child gave me the confidence to know that I didn’t have to call home every time a problem came up. My mom and I have a great relationship because she allowed me to make mistakes without enabling me. For that, I am grateful because I can now do the same for my kids. As a parent, watching your child fail can be hard to watch in the moment but the long term results give you the satisfaction knowing you did the right thing. The kids will have a different process to reach an end result but by holding my tongue and not stepping in to fix something that is not broken I am giving them the best gift of all: confidence to fail and learning independence. We still have 7 years till my first flies the nest so that’s when we are going to learn about managing money, time, be able to make simple home repairs (that’s all dad) and much more. So on that drop off day at college, we can be sure that they’ve got this! Even if they do mess up from time to time.